Toulouse Group, Audio Visual Integration Specialists for the New Zealand Government at the Emirates Team New Zealand base, selected BrightSign to power the digital signage network in the team’s America’s Cup hospitality center in San Francisco, California. Emirates Team New Zealand is a two-time winner of the event and is expected to be among the front-runners for this year’s title. This America’s Cup installation is the latest in a long line of collaborative efforts between Toulouse Group and BrightSign. 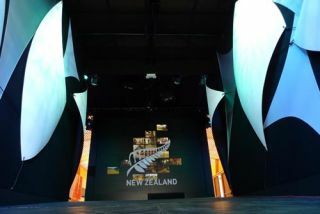 In the past few years alone, Toulouse Group utilized BrightSign’s digital signage players in many venues, including the International Award-winning New Zealand Pavilion at the Shanghai World Expo, the 7,000 square-foot museum at Rotorua Museum New Zealand, and recent new exhibition installs at Carter Observatory New Zealand with its state-of-the-art, full-dome digital theater. While the installation was completed by AV integrator Toulouse Group, the hospitality lounge itself will be staffed by individuals who lack any formal AV training. This necessitated the installation of equipment that is easy to use and very reliable. BrightSign’s solid-state players served that need. Emirates Team New Zealand’s hospitality lounge encompasses a total of 9,600 square feet, comprised of a main gathering area, several ancillary rooms and an outdoor deck. An Ethernet network is deployed throughout the lounge, connecting a total of 23 BrightSign HD120 and HD1020 digital signage players that feed and sync content across a video wall comprised of 19 Full HD 1080p displays. Sound is deployed with two BrightSign players and an EM100 expansion module. Six channels of audio fill the space with sound effects and ambient audio all in sync with the video wall. The remaining four BrightSign players feed projectors that project content on a series of white, sail-shaped screens that meld with the nautical theme of the event. The America’s Cup officially opens on July 4, 2013. The competition lasts nearly three months and includes a number of racing events such as the Louis Vuitton Cup and the Red Bull Youth America’s Cup. The event culminates with the America’s Cup Finals, which run from September 7-21, 2013.